TOP > Vietnam > Shichida Publishing Events a Huge Success in Vietnam! Large-scale publishing events were held in Hanoi and Ho Chi Minh City, Vietnam, on September 9th and 10th 2017. The events were held to celebrate the huge success of the Shichida Method Picture Book Series, “Cultivate Children’s Hearts and Minds”. 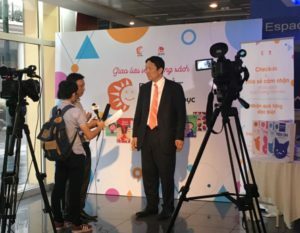 According to Kim Dong Publishing House, the local publisher, “Cultivate Children’s Hearts and Minds” is the second best-selling children’s book series after “Doraemon”, which Kim Dong also brought to Vietnam years ago. Ko Shichida, the series’ author, was invited to answer questions from large audiences in both cities. The events were covered by twenty-five different media sources including local newspapers, magazines, radio, and internet news outlets. The book series was also donated to the National Library of Vietnam. Ko Shichida, Shichida Educational Institute CEO, being interviewed by local media.